Potterton Books – WHAT IS JAMES WEARING? Books are a huge passion of mine, and I have collected hundreds of rare monographs on design, architecture, style, and fine arts. Potterton Books is a world class resource, and I often shop there to find new and out of print books. While perusing Potterson’s shelves today, I was particularly inspired by a few books devoted to my favorite style icons: Gianni Agnelli, The Duke of Windsor, and Cary Grant. I love how they combined stripes with plaids and pattern on pattern. 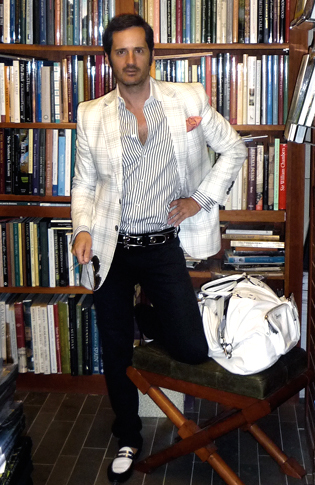 I am wearing a Gucci windowpane plaid jacket over a Richard James black and white cotton shirt with contrast white collar and cuffs, Seamen Schepps white shell with coral beads cufflinks, coral silk pocket square by Hermes, Gucci black patent leather belt with silver gromets, Diesel black skinny jean and Gucci black, white, and silver leather loafers, with sunglasses by Dior and a white leather bag from Gucci.